A slow cooked, thick omelette with potato filling. Simple but delicious! Spanish Omelette, Tortilla or Spanish Tortilla, they are all the same food. A slow cooked, thick omelette with potato filling. So simple but oh so delicious! As far as authenticity is concerned, the tapas bars in Spain would have you believe that the only filling to the Tortilla is potatoes and onions. But I am certain that Spanish folk added a few 'in season' vegetables to the mixture so feel free to experiment with the basic, delicious recipe. Peel the potato(es), cut in half and slice. 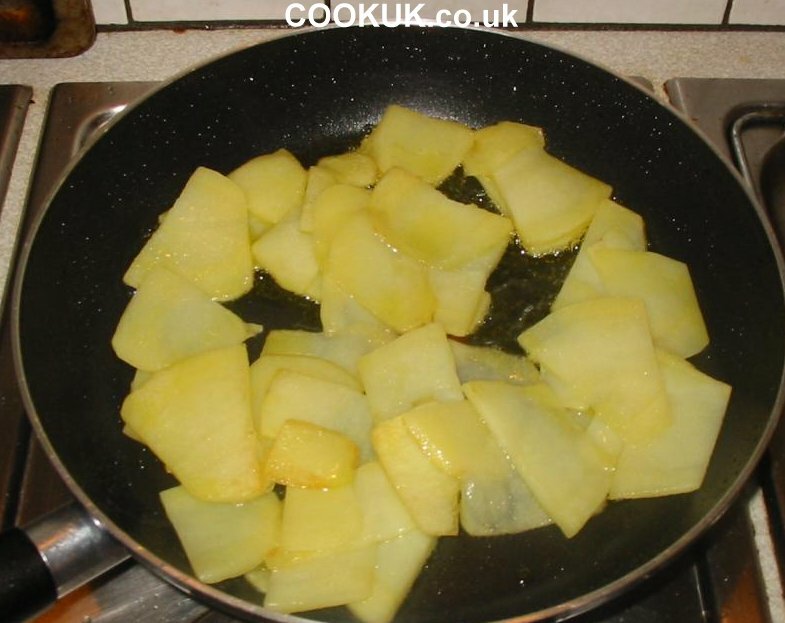 Scatter salt over the sliced potatoes and mix them up to ensure all have some salt on them. Peel the onion, cut in half and finely chop. Save the other half of the onion for use in another meal. Roughly chop the tomato with a sharp knife. 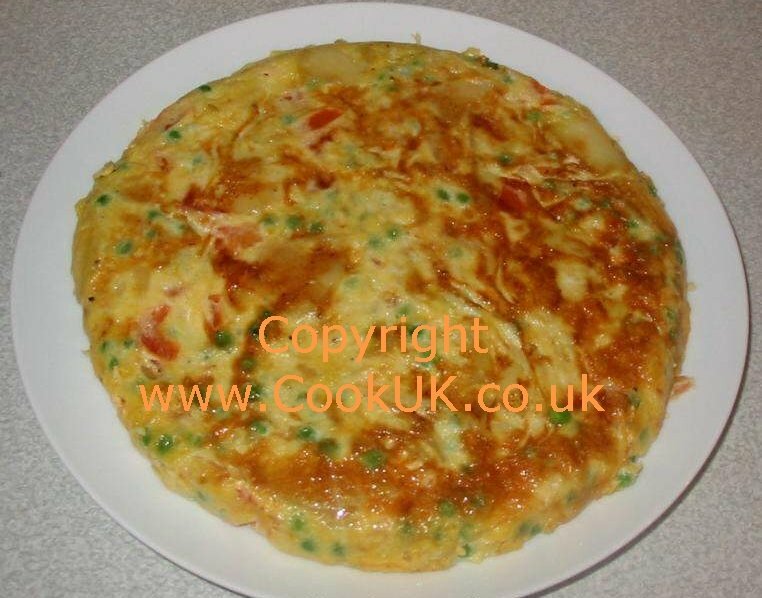 The Spanish Omelette is a very versatile dish because it can be served hot or cold and I guarantee that it is tasty either way. 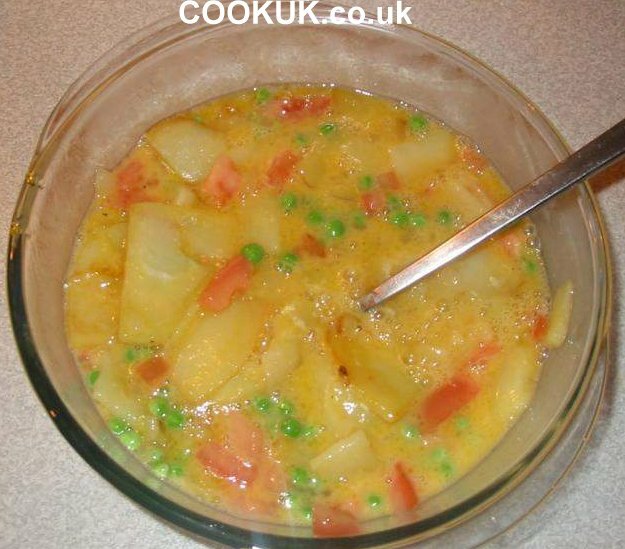 We added peas and tomatoes in the recipe below, but feel free to add whatever vegetables you have to hand - French beans, peppers, runner beans all go well with this Spanish favourite. 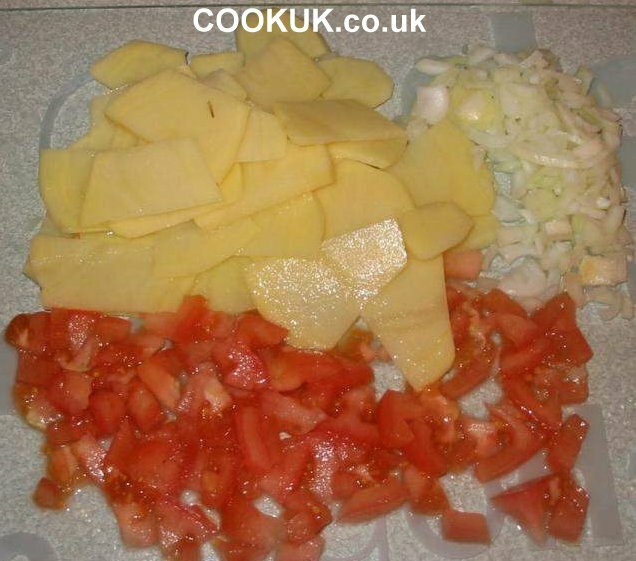 The ingredients below will make a Spanish Omelette big enough for at least two servings. Note: we used 1 tomato as per the recipe not the two shown in the picture below. Also we included a cupful of frozen peas as per the ingredients list. 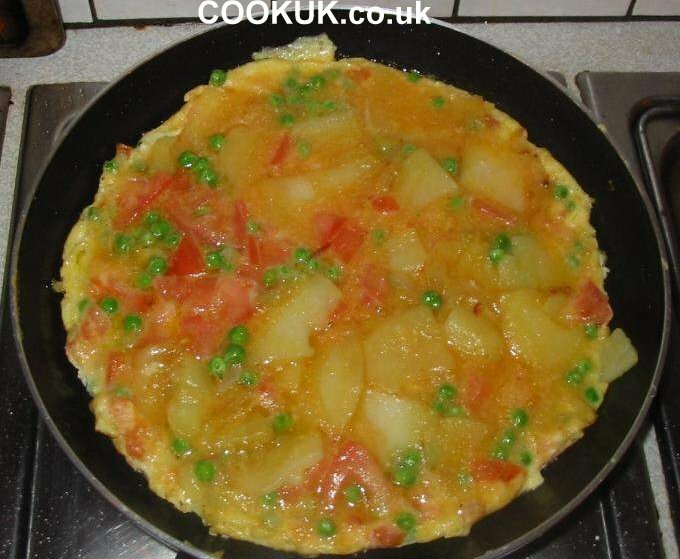 You should leave out the tomatoes and peas if you want the true authentic and original Spanish Omelette. A true Spanish Omelette should be around 3cm / 1in deep. So the ingredients specified below should be in a frying pan which is about 20 cm / 8 inches at the base. 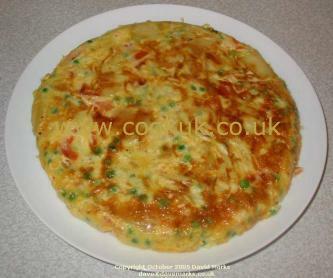 See the pictures accompanying the recipe below which show a "deep" Spanish Omelette. 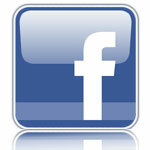 At the end of this page there is a video which you can click to view. It shows the process used to cook our traditional Spanish Omelette. Add two (not all three) tablespoons of olive oil to the frying pan. Heat at a medium setting. When hot, add the potatoes. Keep turning and separating them for 5 minutes. If they begin to turn brown, lower the heat. Break the eggs into a large bowl (large enough to also take the potatoes and onion) and gently whisk them with a fork. Just enough to merge the whites and yolks together. Don't over do this whisking. Add salt and pepper. When the potatoes and onion are cooked, add them to the bowl of eggs. Add the tomatoes and peas. Add the remaining 1 tablespoon of olive oil to the pan and turn up the heat to medium. Wait one minute for the pan to heat then pour the bowl of eggs and vegetables into the pan. Immediately turn down the heat to the lowest setting. Leave the omelette to cook for 15 minutes at the lowest heat setting. When there is almost no liquid on the surface of the omelette turn it by putting a plate on top of the frying pan and turning it upside down. Put the omelette back in the pan. 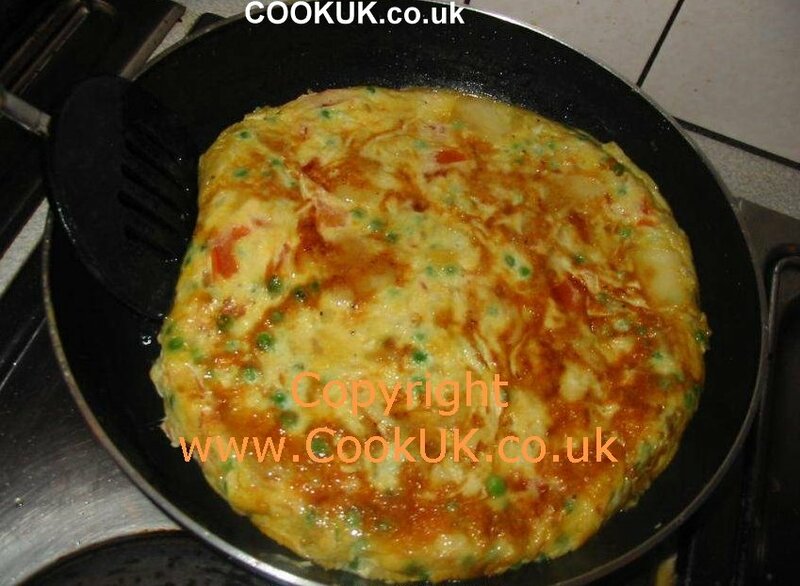 To round the edges, turn the edges of the omelette inwards with a spatula. Let the omelette cook for another 5 minutes. Cut the Spanish Omelette in half and serve on heated plates. If you have some left over, cover it and place it in the fridge. It is equally delicious cold for breakfast or as part of a picnic. It's great on its own, especially if you have included the tomatoes and peas. It also goes well with a salad and some Spanish wine. Will make this tonight. I also believe 'less is more' and keep it simple. Perhaps I just scatter some fresh rucola on the top. Try it with Chorizo. Bacon or sausage with some paprika added will do if you don't have chorizo. I only had one chicken egg, so I used that and 3 duck eggs. I also used one whole sliced Spanish onion, which I fried separately from the potatoes. I served it with a mixed salad and crusty bread. The result was really delicious and my very carnivorous husband scoffed it down!! Lovely recipe and delicious! I made it for my son just home from uni and starving and he ate the lot! Use a shallot rather than a whole onion and then you don't need to discard food. I added in some cooked turkey and it was scrumptious. Thanks. Had this for breakfast today and it was so good !!!!!!! Add blanched and finely chopped spinach for the perfect Spanish Omelette! I have a dedicated 3" pan (to give it height) for making my omelette and choose not to toss and turn it. Instead I alternate between gas hob and grill. This, in my opinion gives a much better and impressive finish. In My household the favourite extra ingredient is sweet chilli sauce. Answer: Thanks for pointing that out. The website is undergoing a major change and that step was left out for some reason. It's back in now and the same as the original recipe. Thanks. I liked the bit "cut as thin as you dare"... and, always a good result. Perhaps I might add some rosemary and oregano. Top Man. We are hosting a Spanish Student who was struggling with English fare. Tried the above recipe last night. Clean plate and complements. Now I'm no cook but will be trying one of your other Spanish recipes before she goes home. A light drizzle....2 AM...and a very hungry Boyfriend...Tried this recipe to suppress midnight hunger craving....I added green chillies, coriander also....very good recipe. So simple and so scrummy, my lot loved this, thanks. Thanks for your video it worked extremely well!! 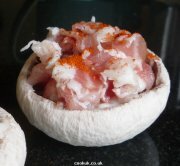 Tasty, great easy to follow recipe - for me who is not a great cook!